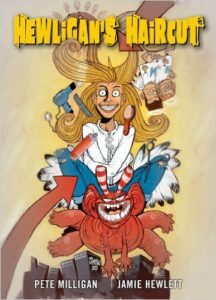 It can be a struggle to get foreign comics in America. While the manga boom proved that there was an audience for translated work, the publishers rarely looked past Japan—where manga was easy enough to format, what with it being the perfect size for mass consumption, other countries’ comics proved more of a challenge. So comic stores are littered with failed imports. Full-sized French hardcovers failed; maybe it was the high price attached to lower-than-usual page counts. But on the other hand, chopping them down to something approaching manga size (as was done with Italian Hugo Pratt’s Corto Maltese) brings cries of bowdlerization. Recently, I’ve gotten my hands on four collections of strips from Britain’s 2000 AD. 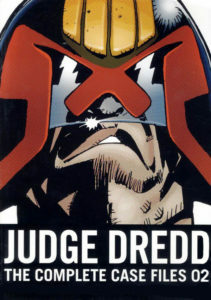 2000 AD is a sci-fi anthology comic that’s been released once a week since 1977, each issue containing a number of short chapters from ongoing stories. In America, the multi-artist anthology has been, for the most part, slowly dying since the ‘70s. Exceptions emerge, but as a viable format, especially on the level of 2000 AD, anthologies just don’t work in the US. 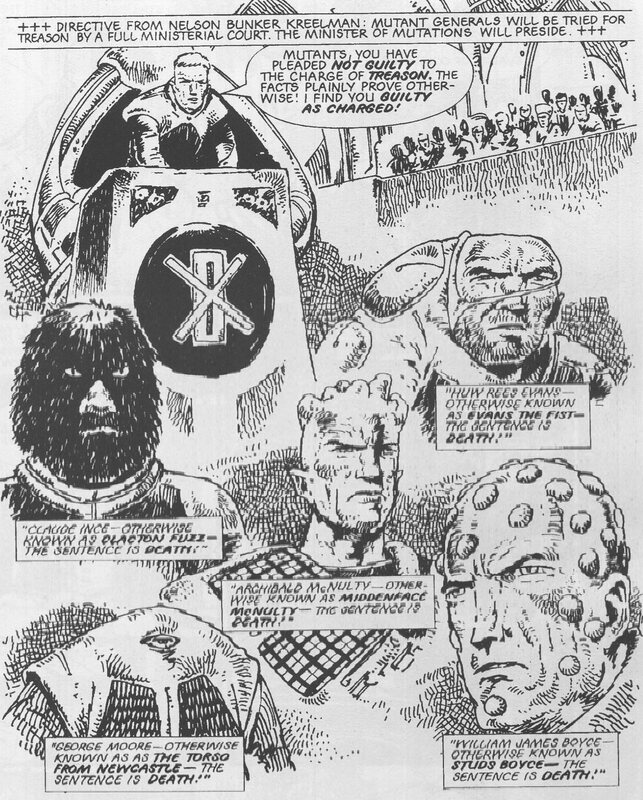 What follows, then, are looks at four different strips from 2000 AD collected in four different formats. This collection is also one of the largest, measuring 8 ¾” by 11 ¾”. It’s a softcover, and the covers sure don’t hold up well. It’s the kind of cover that curls and splits at the corners. Inside, the book collects two discrete storylines, the titular “Portrait of a Mutant” followed by “The Shicklgruber Grab.” This is not the original print order of the stories but is instead chronological order of the fiction. Strontium Dog is the story of Johnny Alpha, a mutant bounty hunter with X-ray eyes. In his irradiated future, he takes jobs that humans find too dirty. “Portrait of a Mutant” details his origin in the wars for mutant rights. In “The Shicklgruber Grab,” Johnny travels back to Nazi Germany to kidnap Hitler and bring him to the future to stand trial. The stories are fast-paced, full of dry humor and quick plot work. With just five pages per chapter, no one is allowed to stand still and emote unless it’s atop a flaming spaceship crashing to its doom. It reminds me of Fury Road: any sort of bloat has been edited out. The large size is perfect for Ezquerra’s scratchy inks and densely populated panels. His mutant designs are varied and unique, and he never repeats himself. But where to after this? There’s no volume numbering anywhere in Portrait of a Mutant and no indication if another book is forthcoming. Is this the end of Johnny Alpha?! This collection only slightly edges Strontium Dog out in size, but only because it’s a hardcover. Collected in 2003, the story was originally printed in eight installments in 1990, making it the shortest collection. 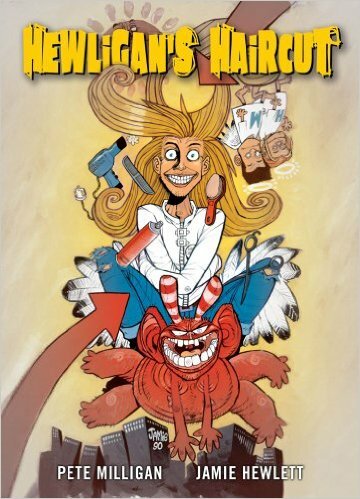 The story sounds complicated: madman Hewligan is released from an asylum after giving himself a strange haircut, and he tours art-inspired parallel dimensions with his manic pixie dream girl, Scarlet. In the end, because this is 1990, Hewligan accepts and overcomes his madness with the power of love and the help of his quirky girlfriend. It’s vaguely insulting in the same way as the spate of MPDG films of the aughts (Elizabethtown, 500 Days of Summer)—madness is cute, and a man can only succeed in life with the help of a woman who does the emotional work for him. 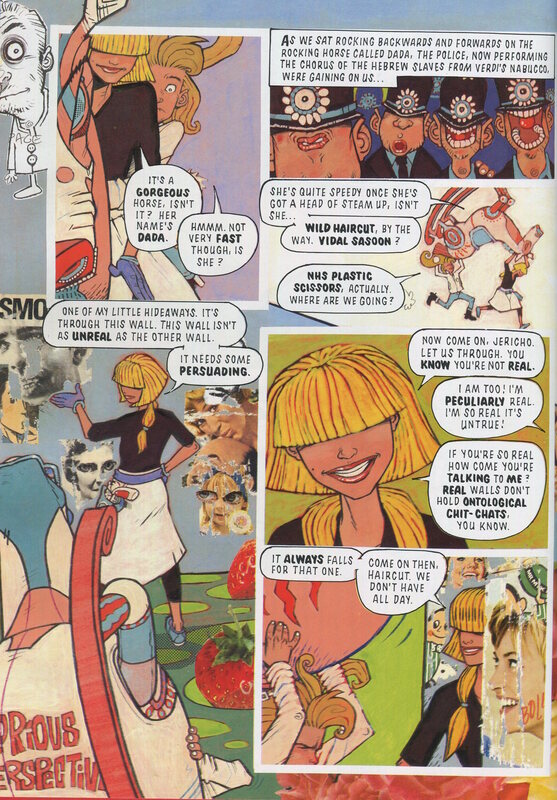 The story has an odd pace, with Hewligan and Scarlet wandering through Dada, Pop Art, and beyond. 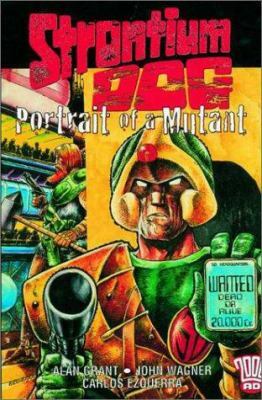 Despite the same structure as Strontium Dog (multiple five-page chapters), it has none of the stakes. Someone is supposedly chasing the protagonists, but with a universe of cartoon escape routes, the tension never gets above a low simmer. But there is some good here! Hewlett, known for his design work with the Gorillaz, constructs a multimedia collage of dueling monochrome and saturation. These stories originally appeared in 1983 and ’84 and were collected in 2005 as a part of a short-lived partnership with DC Comics (of Batman and Superman fame). 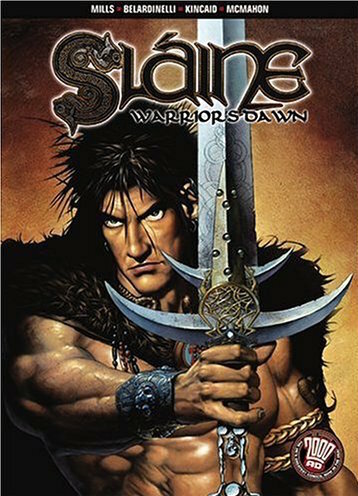 Written by 2000 ADfounder Pat Mills, Warrior’s Dawn follows Celtic barbarian Sláine (and sidekick Ukko) as they hew their way through a fantastical Bronze Age England. 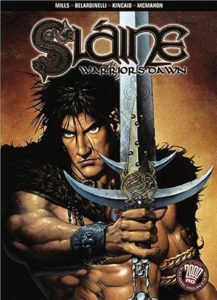 Sláine’s world is strange and cruel. He fights time-displaced dinosaurs, rescues evil druidesses, and rides flying boats. And whenever things get rough, his body warps into a roiling, swelling thing that feels no pain. While some of the art is mediocre, looking posed and confusing, McMahon’s scratchy style is a perfect fit, and it thankfully fills most of the pages. Each of his panels feels like a dirt-smeared etching some archaeologist was lucky enough to dig up. This is the beefiest collection of them all. While the pages aren’t numbered (why not?! ), this book is at least three times as long as the others. With comics that have been around as long as 2000 AD, this approach makes the most sense to me: hundreds of pages in chronological order in clearly numbered volumes. Except four chapters are missing due to lawsuit. The missing chapters took aim at some lovable fast food mascots, and the original publisher settled out of court. Anyway, the stories are similar to Strontium Dog: fast-paced postapocalyptic romps that only pause to tell dark jokes and survey the carnage. Dredd and his fellow judges are fascists working for a literal police state, but the forces they fight are worse, so readers can root for them even if they can’t excuse them. The art is much more consistent than in Sláine; Mike McMahon makes another appearance here, adopting a much slicker style for the brutalist-futuristic look of Dredd’s Mega City. Apologies if this was more of a review of formats than a review of content. Do the same concerns every apply to text-only books? Have you ever found the format of a book to affect your reading of it?